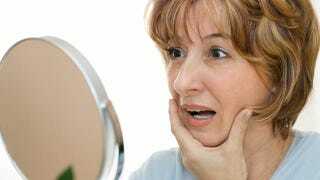 As we all know, wrinkles are hideous indicators that you're old and worthless, and must be warded off at all costs. Now there's another reason to fear the natural lines on your face: They're associated with weaker bones. The researchers gave each women a score for her face and neck wrinkles based on the number of sites with wrinkles and on the depth of the wrinkles. They also measured the firmness of the skin on the women's foreheads and cheeks with a device called a durometer, and measured their bone densities with an X-ray analysis. They found that the worse the wrinkles, the lower the bone density. The results were the same even when factors that influence bone health like age and percentage of body fat were taken into account. Bones and skin use the same building blocks, collagens, which may explain why bone quality correlates with wrinkling. The doctors are continuing their research to see if skin wrinkles could be used to help identify women at risk for bone fractures without expensive tests. "People who have skin wrinkles usually spend a lot of time in the sun. And that promotes the development of a lot of vitamin D, which is good for bone health. So I would have thought we might see just the opposite effect ... This is just the beginning of something — maybe. But I don't think you can hang your hat on it." The doctors who conducted the study also stressed that this is preliminary data and the study isn't even complete yet. But don't think that will stop ladymags from printing alarming articles on the new danger posed by creases in your skin. Those anti-wrinkle creams aren't going to sell themselves! Of course, if this study is correct, using products to fight wrinkles would actually make it harder to spot if a woman is at risk for fractures. Good thing those creams don't actually work.